This trek will introduce you to the less traveled trails of the beautiful and peaceful valley in the Himalayas. Magic Valley as the name suggests is known for its mesmerizing beauty that it offers throughout its trail. The view is truly fascinating and the purity of the environment will keep you awestruck throughout your journey. Waichin is a village approximately 4 kms above Malana. The population of this village is very low because of its location. There are no motorable roads that go to Waichin. The only way to reach is the one mentioned above. In winters even the villagers shift down to Jari because it is impossible to survive there. Most of the spices that they use in their food are grown there only. Best time to visit this village is the month of September. Temperature is low throughout the year so carry warm clothes. Carry your first aid box and other necessary medicines. 1. You can hire a taxi from Bhuntar to Malana Gate it will cost you approx 1400 in INR. 2. Reach Jari ( a place 23 kms from Bhuntar). Best way to do this is to board a public bus which is going to Manikaran/Barshen (20-50 INR). From Jari hire a cab till Malana gate (400INR/person). Then, from Malana Gate you need reach a dam which is at a distance of 2 kms from the gate. You can trek it down or ask your cab driver to take you to the dam. Cab fare would be 300 INR approx. My advice is that you trek it ‘up’ as it will warm your body for whats coming ahead. The trek for Weichin/Magic valley starts from the dam. The dam is currently under construction so you will find a lot of workers in the area. Clicking pictures is prohibited there but the landscape is truly amazing. Climb the 50 steps at the end of the dam to reach a fork. The road on the left leads you to Magic Valley. You will literally have to climb up a mountain to reach there. The road on the right is also a difficult trek and it will take you to Weichin.On the road that goes towards the right, you will see a tower in front of you, make it a temporary destination and start walking towards it. There will come a time when that tower wont be visible so keep interacting with locals for route direcrions towards Weichin. Enroute Weichin you will have to cross 7-8 waterfalls. After crossing atleast 7 such waterfalls look for a way going towards your left- just before the next waterfall. Climb it up to reach Weichin. Keep your fluid intake good and don’t walk in fatigue! Where to stay in Waichin? There are 2-3 camp sites in Weichin. We stayed in the first one. The rates are quite reasonable varying from 800-1200INR/Person. This includes your breakfast, lunch and dinner. These tents are very comfortable making the experience completely satisfying. The only source to charge your devices is a solar panel. It will take a lot of time to completely charge your devices and it totally depends on the amount of sun Weichin is getting on that particular day. There are no cafes in Weichin which is one of the things that separates it from Malana and Kasol . The food that you will get there is prepared on the spot. You just need to tell your camp guy what you want to eat and he will cook it. You can also cook for yourself. The view from the camp site will keep you charged all day and at night when the moon comes out the whole area looks very pretty. You can just sit out side your camp ask for a bonfire and gel up with the people you meet there. What to wear in Waichin? Some of the best hiking shoes are listed below. I particularly love the ‘where to stay’ and ‘how to reach’ sections of your articles. Hii cant we keep our luggage at malana and trek towards magic valley?? Very informative. I want to know that whether do you have any contact number of the person who own those tents, like if i want to do pre-booking then how is it possible? Can you tell me that how much time (in hours) would it take to reach magic valley from that board in jari(from where the trek to malana starts)? Hi, I do have the contact details of one guy (09816202470 – Bhatia). You can call him up and pre book the tents. From Malana gate it took us 3-4 hours to reach Weichin. Hey, very informative blog. But I have some questions. I have both malana and Weichin in my list. So if I want to visit malana and Weichin both and don’t want to stay in malana but in Weichin. How should I go with this plan? Weichin is a 3-4 hour trek from Malana Gate. 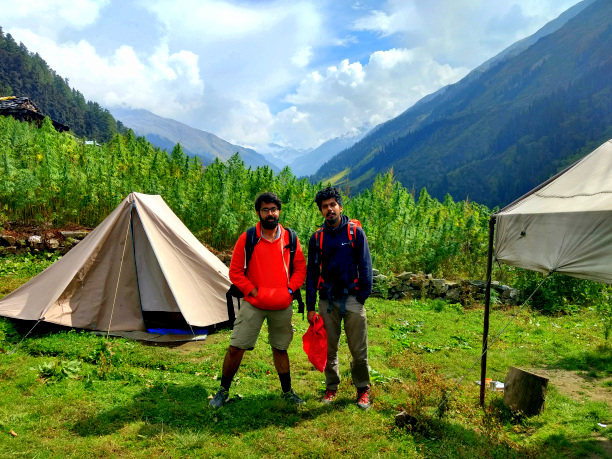 If you dont want stay in Malana then go to Weichin first stay over there for as long as you want and start trekking down from Weichin early at around 8 AM. You will reach Malana gate at around 12 and then you can plan your visit to Malana accourdingly. Make Weichin your priority it is a really beautiful place. I want to malana, magic valley and wiachin…. are all three on same trail or magic-malan on one and wiachin another? Yes. They are on the same trail but there are different routes available. how will be the weather if i want to go to waichin in november?too clod ?